Heavy, rich textures of silk have taken the place of the lighter stuffs used at the beginning of December. Brocards, satin princesse, antique moires, Irish poplins, and heavy chiné silks, such as were worn by the belles who saw Washington inaugurated, are now in vogue. The latter material is called by the French camayeux. It is made of all colors, such as light violet upon dark violet; or, what is more beautiful, large white roses, hardly visible, and partly concealed by light green leaves upon a ground of dark green, forming an ensemble at once coquettish, brilliant, and extremely elegant. Plain poplins are much worn; also royal Pekin or black damask, trimmed with two broad flounces of Cambray lace. Instead of a corsage, a petite corsage of the same material is worn, wide open in front, and closed at the waist with two double buttons, or a large bow of ribbon. Figure 2 represents this style of corsage. The edge is trimmed with lace or fullings of ribbon, the sleeves three-quarters long and in pagoda form. The same figure represents a very pretty style of head-dress. The cap is composed of plain tulle of the lightest description; upon one side of the head, partially covering the ear, is a bunch of roses, or other flowers, pendant. Figure 1 represents a promenade and a morning costume. The Promenade Costume is a high silk dress; the waist and point long; the sleeves three-quarter length and wide at the bottom; the skirt long and exceedingly full; five volants are set on full, each being trimmed at a little distance from the edge by a narrow guimpe. Manteau of light brown cashmere, trimmed with velvet of the same color; closed up in front by four large brandebourgs. Bonnet of a very open form, trimmed entirely with plaid ribbon. The Morning Costume is a jupe of blue silk, very long and full, trimmed down the front with rows of velvet and small silk tassels, the form of an acorn. A cain de feu, a sort of jacket, of blue satin, of a darker shade than the jupe, the small skirt of which is of the Hungarian form. 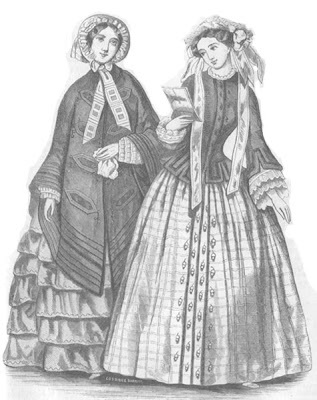 It is trimmed round with velvet and has tassels up the front to correspond with the skirt; the sleeves come but little below the elbow, wide at the bottom, and cut like the skirt. These are likewise trimmed with velvet. Cap of black lace, trimmed with a broad white ribbon, edged with pink. 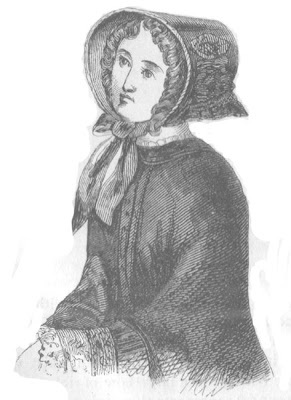 Figure 3 shows a new style of plain velvet bonnet, of rich green. It is made very deep; trimmed with velvet. Satins are made in the same form, of a dark color, the interior of the fronts lined with white, rose, or any other fresh color. These are ornamented with branches of flowers of velvet, or nœuds of plaid ribbon, half velvet and half satin, the colors harmonizing with the bonnet. There are small bonnets of white or pink plush, having for their sole ornament a single bow of satin ribbon, or a ribbon velonté at the sides. This style is very elegant, and particularly adapted for very young ladies, especially when trimmed with a deep fall of rich lace. Those made of pink satin, and trimmed with blonde, forming a bunch upon the side of the exterior, the interior being filled entirely with rows of narrow blonde, are exceedingly graceful. A new style of fringe for ball dresses has lately been introduced. It is extremely light, and composed of a mixture of white and gold, which forms a splendid trimming when placed upon a triple skirt of white tulle. It is also made of pink and silver, which has a beautiful effect upon a dress of pink crape; splendid bouquets of beautiful flowers being arranged so as to loop up the skirts on either side. A new and greatly admired style for Evening Dresses, called d'Adrienne, has lately been brought out in Paris. It is made of the richest materials. The corsage is extremely low, and forms a very deep point, its ornaments being placed en cœur upon the centre of the front. The skirt is open, and is ornamented upon the two sides with streamers of ribbon and nœuds of pearls. The under-skirt of satin is enriched with an echelle of lace or a triple falbalas, the two extremities of which are disposed so as to join the nœuds upon the upper dress. An elegant addition to a lady's toilet has been recently brought out, which recalls the mantillas worn by the Maltese ladies. 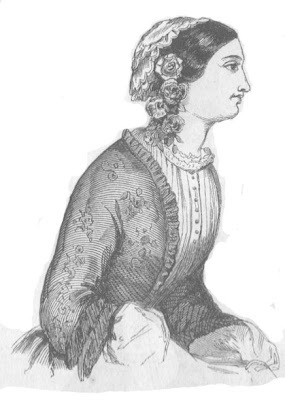 It consists of a kind of pelisse, fulled into the narrow band around the throat, which is concealed by a small collar, having for ornament a volant or frill of Chantilly lace. The lower part of the pelisse, as well as the sleeves, is encircled with four rows of Chantilly lace, surmounted with rows of narrow velvet or watered ribbons, forming a pretty heading. This little garment is extremely elegant for places of amusement, made in pink, blue, or white satin, and trimmed with Brussels or English point lace. Fringes and Cambray lace will be much used this season in the decoration of dresses. Feathers will be much worn, some in touffes, and others si5mply the long single feather, passing over the entire front of the bonnet.